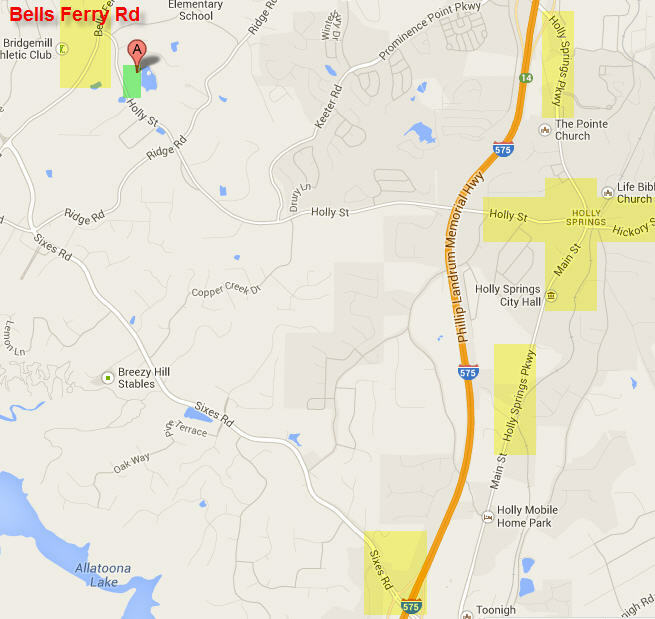 Coming from Bells Ferry, go slightly north of the main Bridge Mill entrance and turn right on Holly Street. The driveway is at the bottom of the hill, on the left. – North, turn right onto Sixes Rd (Exit 11). – South, turn left onto Sixes Rd (Exit 11). 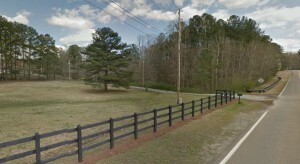 Continue to the end of Sixes Rd (where it dead ends into Bridge Mill). 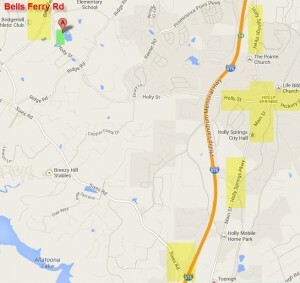 Turn right onto Bells Ferry Rd. Take the first right onto Holly Street. The driveway is at the bottom of the hill, on the left. Go east on Holly Street. Pass the 4-way intersection at Ridge Road. Go to the bottom of the hill (just past the 35 mph sign). The driveway is at the bottom of the hill on the right. Click the below image to enlarge the map.